May 19, 2018 Amy P.
I don't know if there's ever a non-poignant Maya Angelou quote. One could probably just quote everything she says and be done with it. However, this one sentence, pulled from a larger quote, seems relevant to me right now. I have several friends making important decisions, difficult decisions. I myself feel on the cusp of such decisions. I think as we get older, the decisions become clearer and actually fewer in number. We realize we don't have to make quite so many of them. Still, I'm not yet there. I’ve learned that no matter what happens, or how bad it seems today, life does go on, and it will be better tomorrow. I’ve learned that you can tell a lot about a person by the way he/she handles these three things: a rainy day, lost luggage, and tangled Christmas tree lights. I’ve learned that regardless of your relationship with your parents, you’ll miss them when they’re gone from your life. I’ve learned that making a “living” is not the same thing as making a “life.” I’ve learned that life sometimes gives you a second chance. I’ve learned that you shouldn’t go through life with a catcher’s mitt on both hands; you need to be able to throw something back. 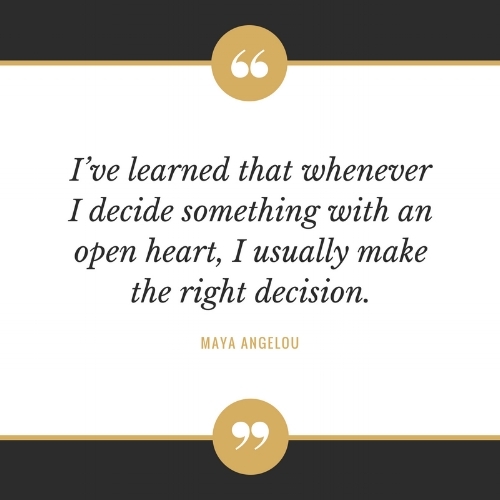 I’ve learned that whenever I decide something with an open heart, I usually make the right decision. I’ve learned that even when I have pains, I don’t have to be one. I’ve learned that every day you should reach out and touch someone. People love a warm hug, or just a friendly pat on the back. I’ve learned that I still have a lot to learn. I like it all, and that bit about having pains but not being one is on-point, no? I am one to complain when I don't feel well, and Angelou reminds me that it doesn't have to be that way. I'm off now into a Saturday of housekeeping, sorely neglected this week, a Barre 3 workout and who-knows-what-else. I should probably action something lovely for dinner, as we don't have soccer games to contend with or any major hustle. It's also dreary outside, so this might be our last weekend to enjoy a cozy meal before summer saunters in. A Well-Spent Day is a lifestyle blog exploring intentional living as a way to end each day well read, well fed and well lived. Thank you! We're excited to keep in touch!